Stone massage therapy has been derived from the Native American Indian culture, popularized in Arizona in 1993 by LaStone Therapy. The use of hot and cold stones has since been adopted and modified worldwide by massage therapists who are interested in providing a unique thermal element to their massage repertoire. 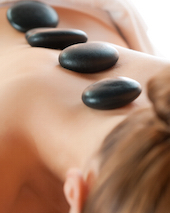 The treatment technique is commonly known as “hot stone massage” or “stone massage”. Stone massage therapy incorporates basalt stones, heated in a water bath, and then used to massage and transmit the retained heat into the joints and muscles. You will experience a deeply relaxing and soothing heat that soaks into the muscles and joints as they are massaged. Chilled marble stones can also be used when a joint or muscle calls for contrasting cold instead of hot treatment. The physiological benefits are similar to Swedish massage with deeper and faster results due to the use of the heated and chilled stones. Stone massage therapy is excellent for the care of sports injuries and the maintenance of optimal sports performance. It is beneficial for any one with joint pain and muscle spasticity. Stone massage therapy treatments are 1 hour and are covered under extended health care benefit plans which include Massage Therapy coverage.